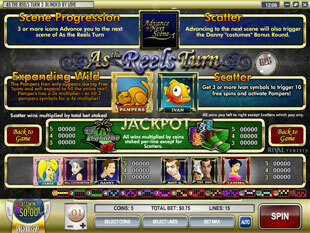 As the Reels Turn 3 Slots is an episode-based i-slot created by Rival in 5 reel 15 paylines format. Let’s continue our adventures and find out the next scenes of this captivating story that also can bring you the top jackpot of 1,500 coins. What is more, this prize can be increased up to 6,000 coins during bonus feature. So, keep your fingers crossed to activate Free Spins and Danny Bonus Round that can present you really astonishing awards. You can enjoy this game with a fantastic storyline as well as the previous episodes in a flash version. So, you can play it without downloading special software on your computer. To watch the other parts try As the Reels Turn 1 and As the Reels Turn 2. This time you meet well-known heroes from the previous series and find out the new things about their life. There are only two new icons – Pampers the Cat and his owner Mrs Livingston. Look for the great prizes presented by this animated symbols and don’t forget about such icons as Danny, Vanessa, Ivan the Fish, Matt G, Jamie, The Don, El Paradiso Casino, Poker Chips and Advance to Next. There are such coin sizes as $0.01, $0.05, $0.1, $0.25, $0.50. Thus, you can cover all 15 paylines with the minimum bet of $0.15 while the maximum bet of this game is $37.50. The highest jackpot is 1,500 coins or $3,750 for 5 Casino Chips. The second jackpot is 1,000 coins or $2,500 for 5 El Paradiso Casino. The third highest jackpot is 200 coins or $500 for 5 Jamie or for 5 Mrs Livingston or for 5 Danny. The Pampers is the wild symbol. Unfortunately it appears during Free Spins only. Anyway, this icon can bring you really incredible prize. Thus, it can substitute any other icon to produce winning combination for you as well as expands on the whole reel. What is more, it also triples your winnings. 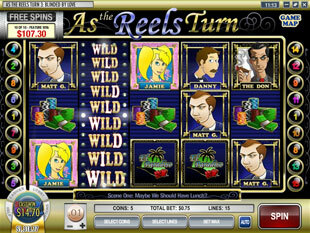 In case, you are lucky enough to get two wild symbols on the reels, your prizes will be quadrupled. In other words, you can win up to 6,000 coins or $15,000. There are two scatter symbols in this game – Ivan the Fish and Advance to Next. Both of them can activate bonus games that guarantee you interesting prizes. It should be noted that three Advance to Next logos invite you to the next scene of As the Reels Turn 3. Free Spins. Get three or more Ivan the Fish on the reels and activate 10 Free Spins with a wild multiplier. As it has already been mentioned above, you can win the maximum of 6,000 coins or $15,000 this time. Even if you don’t get the best combination, the wilds appear very often and you will win some attractive prizes for sure. Danny Bonus Round. 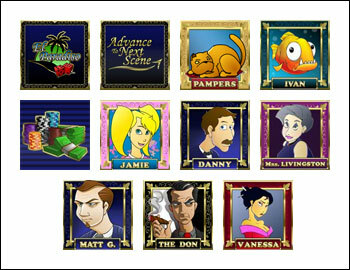 Three or more Advance to Next icons present you the next scene of the game as well as activate Danny Bonus Round. Danny is preparing for his date with Jamie and as you can see he is nervous. Your task is to help him to choose the best suit. The wardrobe behind him continuously opens and you should press stop to find out if you make the right choice to impress Jamie and get the appropriate prize. Tastes differ and the usual tuxedo is not the only thing that brings you the best award. 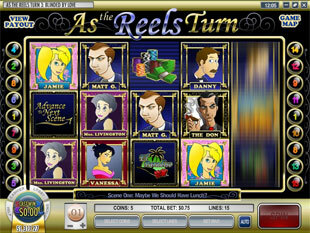 As the Reels Turn 3 slot machine reveals you almost all the mysteries of the previous games as well as presents you incredible prizes. Just be lucky enough to win the bonus features of this game and activate wild multiplier that can increase your prizes enormously.